t was Sunday morning in Hong Kong, and Ka Ho Restaurant was packed. For it being the weekend, we were surprised at how many people were out. We had just spent the week touring around the city so we were ready to take it easy that day. In the restaurant, ladies with handkerchiefs wrapped around their heads pushed carts full of steaming bamboo baskets, peddling in singsong Cantonese, while men in white shirts rattled past us with stacks of ceramic plates that looked ready to tumble. 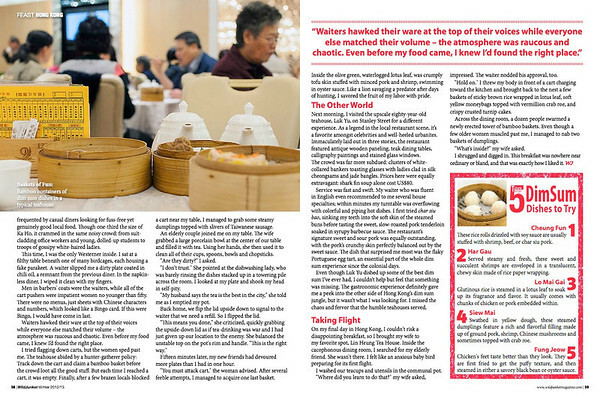 Among the hundreds of diners – mostly made up of elderly locals sipping black tea, shaking their legs, and reading newspapers – my wife and I were the only Westerners. I wanted to order adventurously, but my cautious wife – who packed granola bars in her suitcase on our first trip abroad – vetoed the most exotic dishes. Thankfully the picture of a roasted pigeon with mouth agape and the sound of mud limonene and duck feet rolls helped quell my curiosities. “What do you recommend?” I asked the waitress. She didn’t understand me, so the manager came forward. But instead of asking us for our order, he only tried unloading unappetizing cherry-topped pastries onto our table. I surrendered, picking four items bland enough for my wife to try. In front of her were eight bamboo baskets and that bowl of rice and meat. I was about to let her decide our meal for us, but my wife courteously rejected the offer. Our chicken-hearted meal soon arrived, including boiled bak choi (Chinese vegetables that packed a punch of freshness), pine nut vegetable jiaozi (dumplings) and shrimp cheung fan (slippery rice rolls with bits of shrimps hidden within). In retrospect, we were relieved that we had picked our own meal – our four baskets stuffed our stomachs to the brim; but they still left me curious for more authentic bites. The next morning, I knew I had to be more courageous. I left my wife in bed and ventured down the famous Aberdeen Street, where two old ladies pushed delivery wagons up the steep slope. If old women can tow carts uphill, I should be able to eat pigeon and muddy duck feet, I figured. At the bottom of the hill was Lin Heung Tea House, which has been operating since the end of World War I. Teahouses are a fixture in Hong Kong’s culinary scene, frequented by casual diners looking for fuss-free yet genuinely good local food. Though one-third the size of Ka Ho, it crammed in the same noisy crowd: from suit-cladding office workers and young, dolled-up students to troops of gossipy white-haired ladies. This time, I was the only Westerner inside. I sat at a filthy table beneath one of many birdcages, each housing a fake parakeet. A waiter slipped me a dirty plate coated in chili oil, a remnant from the previous diner. In the napkin-less diner, I wiped it clean with my fingers. Men in barbers’ coats were the waiters, while all of the cart pushers were impatient women no younger than fifty. There were no menus, just sheets with Chinese characters and numbers, which looked like a Bingo card. If this were Bingo, I would have come in last. Waiters hawked their ware at the top of their voices while everyone else matched their volume – the atmosphere was raucous and chaotic. Even before my food came, I knew I’d found the right place. I tried flagging down carts, but the women sped past me. The teahouse abided by a hunter-gatherer policy: Track down the cart and claim a bamboo basket before the crowd loot all the good stuff. But each time I reached a cart, it was empty. Finally, after a few brazen locals blocked a cart near my table, I managed to grab some steamy dumplings topped with slivers of Taiwanese sausage. An elderly couple joined me on my table. The wife grabbed a large porcelain bowl at the center of our table and filled it with tea. Using her hands, she then used it to clean all of their cups, spoons, bowls and chopsticks. “Are they dirty?” I asked. “I don’t trust.” She pointed at the dishwashing lady, who was barely rinsing the dishes stacked up in a towering pile across the room. I looked at my plate and shook my head in self-pity. “My husband says the tea is the best in the city,” she told me as I emptied my pot. Back home, we flip the lid upside down to signal to the waiter that we need a refill. So I flipped the lid. Fifteen minutes later, my new friends had devoured more plates than I had in one hour. “You must attack cart,” the woman advised. After several feeble attempts, I managed to acquire one last basket. Inside the olive green, waterlogged lotus leaf, was crumply tofu skin stuffed with minced pork and shrimp, swimming in oyster sauce. Like a lion savaging a predator after days of hunting, I savored the fruit of my labor with pride. 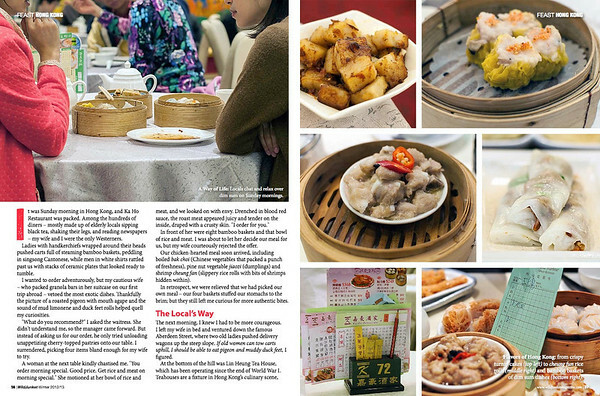 Next morning, I visited the upscale eighty-year-old teahouse, Luk Yu, on Stanley Street for a different experience. As a legend in the local restaurant scene, it’s a favorite amongst celebrities and well-heeled urbanites. Immaculately laid out in three stories, the restaurant featured antique wooden paneling, teak dining tables, calligraphy paintings and stained glass windows. The crowd was far more subdued: clusters of white-collared bankers toasting glasses with ladies clad in silk cheongsams and jade bangles. Prices here were equally extravagant: shark fin soup alone cost US$80. “Where did you learn to do that?” my wife asked, impressed. The waiter nodded his approval, too. Service was fast and swift. My waiter who was fluent in English even recommended to me several house specialties; within minutes my turntable was overflowing with colorful and piping hot dishes. I first tried char siu bao, sinking my teeth into the soft skin of the steamed buns before tasting the sweet, slow-roasted pork tenderloin soaked in syrupy barbecue sauce. The restaurant’s signature sweet and sour pork was equally outstanding, with the pork’s crunchy skin perfectly balanced out by the sweet sauce. The dish that surprised me most was the flaky Portuguese egg tart, an essential part of the whole dim sum experience since the colonial days. Even though Luk Yu dished up some of the best dim sum I’ve ever had, I couldn’t help but feel that something was missing. 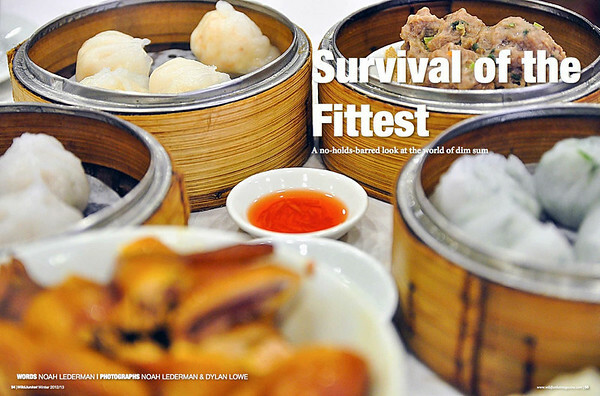 The gastronomic experience definitely gave me a peek into the other side of Hong Kong’s dim sum jungle, but it wasn’t what I was looking for. I missed the chaos and fervor that the humble teahouses served. On my final day in Hong Kong, I couldn’t risk a disappointing breakfast, so I brought my wife to my favorite spot, Lin Heung Tea House. Inside the cacophonous dining room, I searched for my elderly friend. She wasn’t there. I felt like an anxious baby bird preparing for its first flight. I washed our teacups and utensils in the communal pot. “Hold on.” I threw my body in front of a cart charging toward the kitchen and brought back to the nest a few baskets of sticky brown rice wrapped in lotus leaf, soft yellow moneybags topped with vermillion crab roe, and crispy crusted turnip cakes. Across the dining room, a dozen people swarmed a newly erected tower of bamboo baskets. Even though a few older women muscled past me, I managed to nab two baskets of dumplings. “What’s inside?” my wife asked. I shrugged and digged in. This breakfast was nowhere near ordinary or bland, and that was exactly how I liked it. Noah Lederman writes the travel blog Somewhere Or Bust. His travel writing has appeared in The Economist, Chicago Sun-Times, Gadling, and elsewhere. He is completing a book about misadventures.